Rather than being a book about ‘development’ per se, this work, first published in 1975, is instead a book about ideas about development, designed for those drawn by a concern over social injustice into the development field. 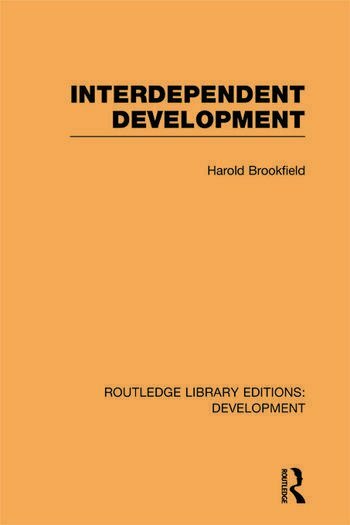 In a selective review of theory, which gives particular emphasis to the spatial dimension in Western, Marxist and neo-Marxist thought, Harold Brookfield traces the evolution of ideas about world inequality and the problem of development from the days before the ‘underdeveloped countries’ were considered to be a major problem, through the years dominated by ‘economic growth’, to the more searching approaches of the contemporary era. The central argument of the book is that development is a ‘totality’, which cannot properly be understood by separation into parts. The ‘developed’ and ‘underdeveloped’ countries constitute one interdependent system, and change in one cannot be understood without consideration of the other.